Sushi is often regarded as a healthy choice because it contains nutrient-rich ingredients. Since the 1970s, America’s love affair with sushi has grown. 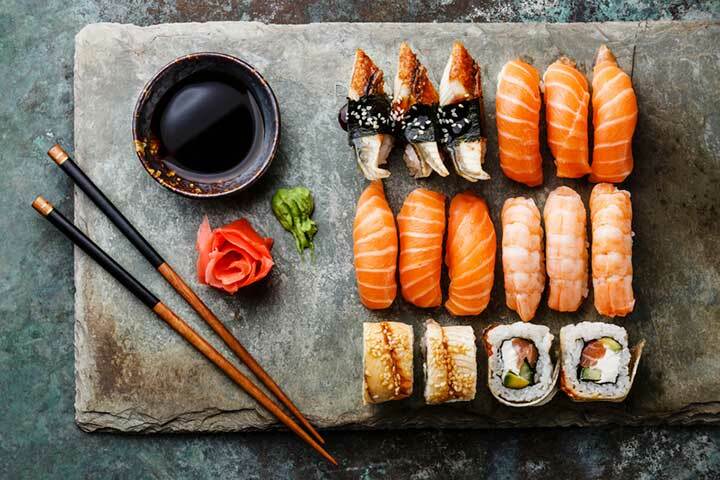 With its simple combination of vinegar-flavored rice, fish, and vegetables, sushi has gone from being a trendy dish mainly found on the West Coast to a regular part of American cuisine. You’ll find it everywhere, from fancy restaurants to simple dinners in both large cities and small towns. In fact, according to the Statistic Brain Institute, there are more than 3,900 sushi restaurants in the United States, with a total annual revenue of $2.25 billion. What makes this Japanese dish so appealing? And, more important, is sushi healthy? Nigiri: A molded rectangle of rice topped with fish or seafood. Sashimi: Fish or shellfish served without rice. Maki: Rice and other fillings wrapped in seaweed. 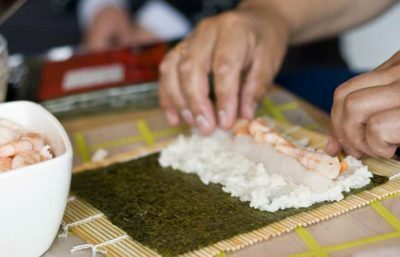 Uramaki: Unlike maki, uramaki rolls have the rice on the outside instead of the seaweed. This is the most popular variety served in the U.S.
Temaki: Rice and fillings placed inside of a hand-rolled cone made of seaweed. There are additional sushi types that are more popular in fine-dining restaurants and/or outside of the U.S., including Gunkan maki, chirashizushi, and narezushi. If you’re unfamiliar with sushi, you might assume that all types contain raw fish, but there are a variety of cooked and vegetarian sushi rolls as well. Sushi is often served with a variety of sauces and condiments—such as soy sauce, spicy mayo, wasabi, eel sauce, and pickled ginger—placed inside or on top of the roll, as well as on the side. With so many types from which to choose, is sushi healthy in all forms? Let’s find out why sushi’s a top choice for healthy eaters and how to prevent it from sacrificing your diet goals. At UHN, we frequently tout the health benefits of fish: It’s low in fat and high in protein, vitamins, and minerals, including omega-3 fatty acids, which can improve cardiovascular health, decrease inflammation, and reduce memory loss. Sushi is often wrapped in nori, a popular type of seaweed that carries its own list of health benefits. Seaweed is rich in iodine, which has antioxidant and anticancer properties, as well as magnesium, iron, calcium, protein, and fiber. It can also help prevent inflammation, aid in weight loss, and control blood sugar. In 1966, a Japanese man named Norioshi Kanai and his Jewish business partner Harry Wolff opened the first sushi restaurant in the Little Tokyo neighborhood of Los Angeles. Japanese businessmen frequented the restaurant and brought their American colleagues with them. The first sushi bar outside of Little Tokyo opened in Hollywood in 1970 and was popular among celebrities. Sushi bar openings in New York and Chicago followed and the rest, shall we say, is history. And if you’re lucky enough to get your hands on real wasabi to spice up your sushi—and not the imitation paste that is served in most restaurants—you’ll get even more health benefits. Wasabi contains significant amounts of beta-carotenes, glucosinolates, and isothiocyanates, which fight off cancer, bacteria, and inflammation. Plus, adding vegetables, such as cucumber and avocado, to your sushi will boost your nutrient intake even more. The nutritional content of sushi varies, depending on how it’s prepared, but according to SushiFAQ.com, the average serving of sushi can contain 19 to 500 calories, 0.1 to 21 grams of fat, zero to 64 grams of carbs, zero to 7 grams of fiber, and two to 20 grams of protein. But if you know how to order sushi, you’ll be able to find varieties that are lower in calories and fat without losing the protein and fiber content. Skip the sauces and condiments. Sushi rolls that have the words “spicy” or “creamy,” in their names often contain mayo-bases sauces that can add to the roll’s saturated fat content. Eel, soy, and plum sauces that are drizzled on top or served on the side can also be high in sugar and/or salt, so read the ingredients carefully. Beware of “crunchy” or tempura rolls. Fried tempura flakes give these types of rolls their crunch, but they also add on saturated fat and carbs. This goes for deep-fried sushi rolls as well. If you have a gluten intolerance, watch out California rolls. These rolls often include imitation crab meat, which is made from white fish, wheat, coloring, and flavoring. Also watch out for the soy sauce—most varieties are fermented in wheat. Check out “What Has Gluten in It? 12 Surprising Food Sources” for more information. Watch out for the rice. Although rice is considered the main component of sushi, it may be doing more harm than good. If your favorite sushi spot uses more rice than other restaurants, or if their rice is prepared with additional sugar and/or salt, it could make your meal less healthy. Is Sushi Healthy Enough to Eat Every Day? The old saying “moderation is key” also applies to sushi for several reasons. While doctors recommend making fish and vegetables a regular part of your diet, when it comes to raw or undercooked fish and seafood, it’s recommended that you limit your intake. Raw or undercooked fish is known to contain parasites or bacteria that can be harmful to those at risk for foodborne illness, including pregnant women, young children, and those with weakened immune systems. Certain types of fish also contain high levels of mercury, which can cause heart attacks, pregnancy complications, and impaired mental development in children. Fish that contain the highest levels of mercury include mackerel, tilefish, tuna, orange roughy, and shark. There aren’t any official recommendations for how much sushi in one week or month is too much, but if you’re at a lower risk for foodborne illness and you stick to fish and seafood that contain lower levels of mercury, such as salmon and shrimp, eating sushi a few times a month should be safe. To lower your risk of illness even further, stick to rolls that contain cooked fish or seafood, or sushi made only with vegetables. Swap out white rice for brown rice. Brown rice contains a higher level of nutrients than white rice. It’s also higher in magnesium and fiber, which helps control blood sugar. Smell for freshness. If the sushi you’re being served smells “fishy,” that probably means it’s old. Fresh sushi doesn’t have much of a scent at all. Do your homework. Check your favorite sushi restaurant’s health inspection reports online, if possible, to make sure its following your state’s health guidelines. Also, be careful with sushi buffets or “all-you-can-eat” specials, which often serve lower-quality ingredients. Pair your sushi with a healthy side. Ordering that second sushi roll may be filling, but it can also put you over your daily carb count. Pair your sushi order with some miso soup or a small salad to satiate your hunger. Go for avocado. This popular sushi filling contains lots of fiber to keep you full and healthy fats to benefit your heart. 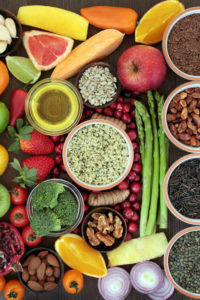 add, anticancer, antioxidant, bacteria, blood sugar, brain, calcium, calories, cancer, cardiovascular, cardiovascular health, children, control blood sugar, diet, fiber, food, foodborne illness, ginger, glucosinolates, gluten, gluten in, gluten intolerance, health, healthy fats, heart attacks, improve cardiovascular health, inflammation, iodine, iron, is sushi healthy, magnesium, memory, memory loss, mercury, nutrients, omega 3, omega 3 fatty acids, protein, soy, sugar, vegetables, vegetarian, vitamins, vitamins and minerals, what has gluten, what has gluten in it. Hi Eugene, at the top of the page underneath the article’s headline and byline, there are a group of buttons. Click on the green button (with the image of a printer) in order to print. It’s the second-to-last-button in the row. Thanks! Most sushi places use farmed salmon which are low in omega 3 oils, and most are raised in ways which are harmful to the wild salmon population. I thought you might be interested in this article on https://universityhealthnews.com: Is Sushi Healthy?